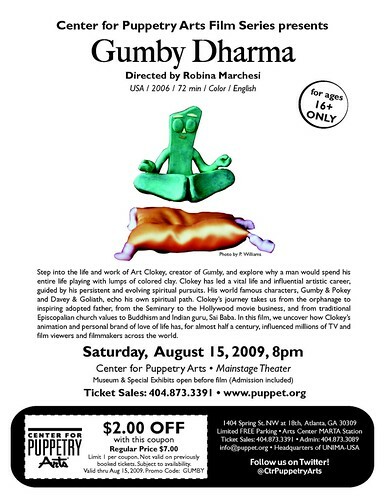 Come see Gumby Dharma by Robina Marchesi on Saturday, August 15th, 8pm, at the Center for Puppetry Arts. Admission includes all museum exhibits, and there's a beer and Wine cash bar. Step into the life and work of Art Clokey, creator of Gumby, and explore why a man would spend his entire life playing with lumps of colored clay. Sadly, the filmmaker died shortly after the film was completed so it never had much of a release- it has not available on DVD in the US, so this is a rare opportunity to see it!